Rootless voicings sound more professional then root based voicings and they voice lead much more smoothly in the context of a 251 progression. If you’ve not checked out the rootless voicings tutorial, I’d recommend you check that out before watching this lesson. In this lesson we work through rootless 251 progressions in a number of different keys using rootless voicings. Rootless 251 progressions are also extremely useful in a solo piano context and are a great voicing choice to support soloing and improvisation in your right hand. To build a 251 progression, we need the 2, 5 & 1 chords from the scale. In the key of C that would give us D-7, G7 and Cmaj7. We can use these chords to play a simple root based 251 progression and whilst this might sound OK, the rootless 251 progression sounds much more sophisticated. What Is The Rootless 251 Progression? Starting off with the 2 chord, D-7, we add the 9 and drop the root which gives us F – A – C — E which is the 3rd, 5th, 7th & 9th . To get to the 5 chord which is G7, all we have to do is drop one note by half a step. This note is C, the 7th of D-7. The C drops by half a step to become the 3rd of G7 and the rest of the notes stay the same. We now have the 7th, 9th, 3rd & 13th of G13. Then to get to the 1 chord, the 7th of G7 which is F drops by half a step to become the 3rd of C major 7 and we play a Type A Rootless Voicing for Cmaj7. You should notice that the chords lead from one to the next very smoothly and there is also very little hand movement between the chords in a rootless 251 progression. You need to be able to play rootless 251s in your left hand. These voicings are extremely useful when you come to soloing in your right hand. The reason these that they are useful is because there is very little hand movement between the chords which allows you to focus your attention on creating lines in your right hand. We have just looked at a Type A rootless 251 in the key of C. Now let’s look at Type B. To play a Type B Rootless 251, we take the top two notes of the 2 chord and put them on the bottom. This gives us a D-9 chord in its 2nd inversion. This time, to get to G13 chord, the same movement happens (7th of D drops by half a step to become the 3rd of G). However, now that the 2 chord has been inverted, the 7th is on the bottom so it is the bottom note that drops by half a step and all other notes remain the same. Finally to resolve to the 1 chord, we play a Type B rootless voicing for Cmaj7. First of all play the root of the chord in your left hand and the rootless voicing in your right hand and work your way around the circle of fourths. Once you are comfortable with this, drop the root and play the voicings just in your left hand. Remember to practise both Type A and Type B rootless voicings so that you can always play the 251 in the correct register of the piano. You should practice rootless 251s every time you sit at the piano until you can play them in all 12 keys without mistakes. 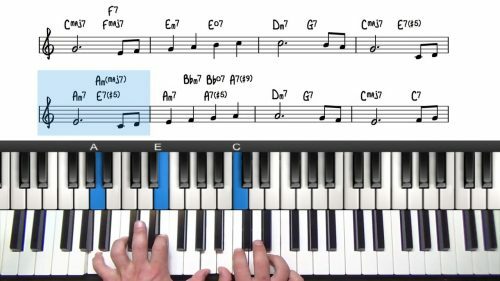 Even if you just do 5 or 10 minutes a day on these progressions, you will eventually master them in all 12 keys. The 251 progressions (both major and minor) are the DNA of jazz and so they are the essential theory for you to learn. Virtually every jazz standard will contain a 251 in some form and so memorising these important progression will help you immensely when playing jazz standards.